As The Office star and bona fide muso David Brent (aka Ricky Gervais) gears up to give fans a glimpse at life on the road in upcoming film, erm, Life On The Road, he's offered up a further treat in the official David Brent Songbook, set to coincide with the movie's release this summer. An official companion to the film, the songbook features song introductions and music written by Brent, arranged for piano, voice and guitar. "This book is a dream come true for Brent," says Gervais. "At last, the chance to pontificate about his art and divulge the stories behind such classics as Equality Street, Native American, Lady Gypsy, Slough, and Please Don't Make Fun Of The Disableds." Life On The Road follows Brent as he balances selling cleaning products with his lifelong dream of rock stardom with his band Foregone Conclusion. 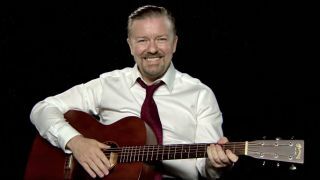 The David Brent Songbook hits the shops on 11 August - until then, tide yourself over with a guitar lesson or two, Brent-style.